As the winter wears on, you are likely to experience some cold symptoms at some point. Nearly everyone gets the sniffles and sneezing at some point during the winter. What many people do not realize is that those symptoms could be a sign of winter allergies. While the symptoms can be similar, there are some differences. A cold and allergies can have similar symptoms. You can have a runny nose, persistent sneezing, and congestion. If these are the only symptoms you are having, one way you can distinguish between the two is duration. A cold generally doesn’t last more than two weeks. Allergies will persist as long as the allergen is present. If your symptoms last longer than two weeks, it’s time to consider allergies as the culprit. There are some symptoms you may have with a cold that are not associated with allergies. Fever, chills, and a persistent cough are signs of a cold. While you can have a slight cough with allergies, most often persistent coughing is a sign of a common cold. Severe chest congestion is also a sign that a cold is the problem. Allergies have some symptoms that you will not have with a cold. If you have winter allergies you will have itchy and watery eyes. You can also consider the frequency of your symptoms. If you only have symptoms when you are at home, but they are less at work, odds are good that you have allergies. If you have cold symptoms that last more than two weeks, you should see your doctor right away. You may have the flu or a more serious condition. You may also have allergies. 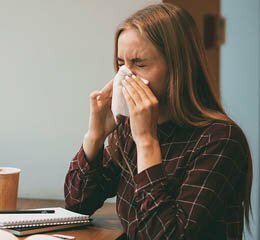 Winter allergies are usually caused by indoor allergens, and your doctor can run an allergy panel to determine what you need to change about your environment.